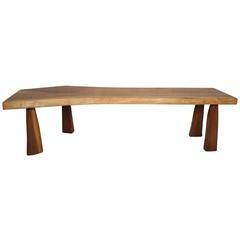 Sculptural bench or table in solid Brazilian rosewood with Brazilian rosewood burl legs. Purchased in Mexico, 1960s. A well-crafted piece featuring a spectacularly grained, polished live-edge top with three burl legs each with its own abstract sculptural character. 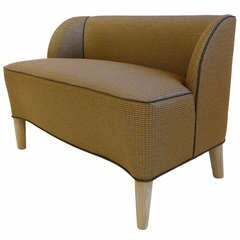 Belying its spontaneously naturalistic appearance, this is a carefully composed work balancing the shape of the found rosewood trunk section with the graining in the top, the extrusions and notches in the body, and the forms and placement of the legs. An impressive example of this genre, from the collection of a family who also acquired top-shelf George Nakashima works in the same period. Fine overall condition. Cleaned and polished. Minor wear consistent with age and use, along with natural variables inherent to the material. Small Californian live edge bench in solid wood. Large Californian live edge bench in solid wood. Extra large Californian live edge bench in solid wood. Mid Century free-form solid monkey pod table from the 1960s. 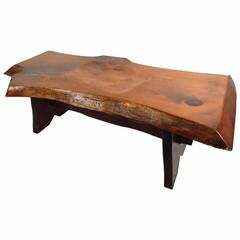 This versatile piece is sturdy enough to use as a custom bench or coffee table. This live edge slab bench features a one of a kind top cut from a tree which offers a rustic accent to any home or office. Please confirm item location (NY or NJ) with dealer.